Summer sunflowers are here along with warm, sunny days. 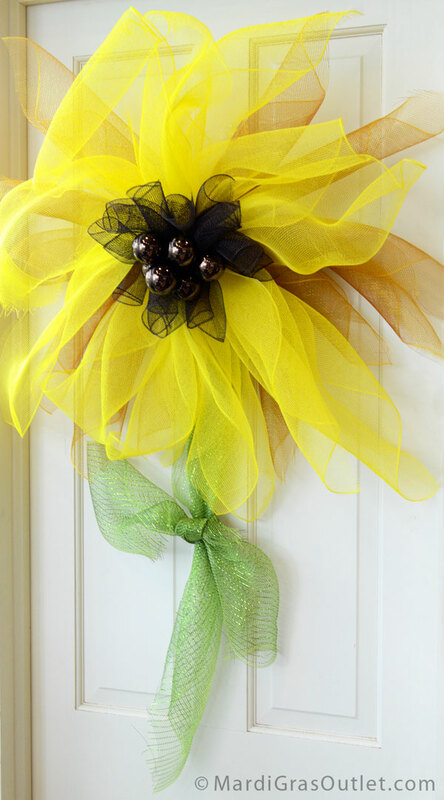 We couldn't resist decorating our front door with a new summer inspired creation... the Deco Mesh Sunflower! This simple, pretty flower is easy to make and doesn't require any form! Keep reading to learn how to make one. 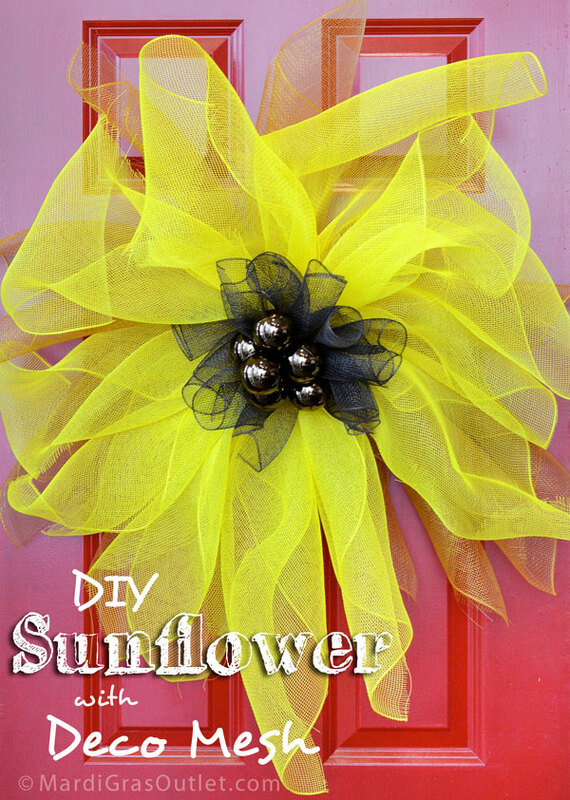 The pretty sunflower on our door as a alternative to a summer wreath! 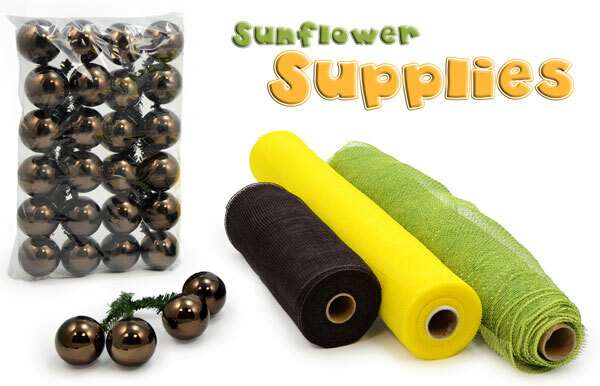 The basic one color Deco Mesh Sunflower costs $21, and there will be product left over, (about 8 of the tinsel ties and most of the 10" brown mesh. 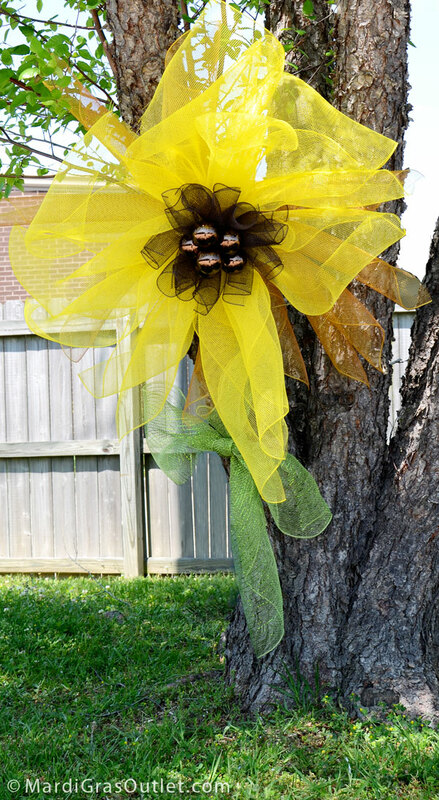 The Deluxe version of the Deco Mesh Sunflower costs under $34, and you are able to make 2 sunflowers by using both the solid yellow mesh and the two-tone brown and gold. Each sunflower took about 30 minutes to make. Begin by measuring out 24 inches of yellow mesh. Cut here and repeat. These curls of mesh will become the sunflower petals. 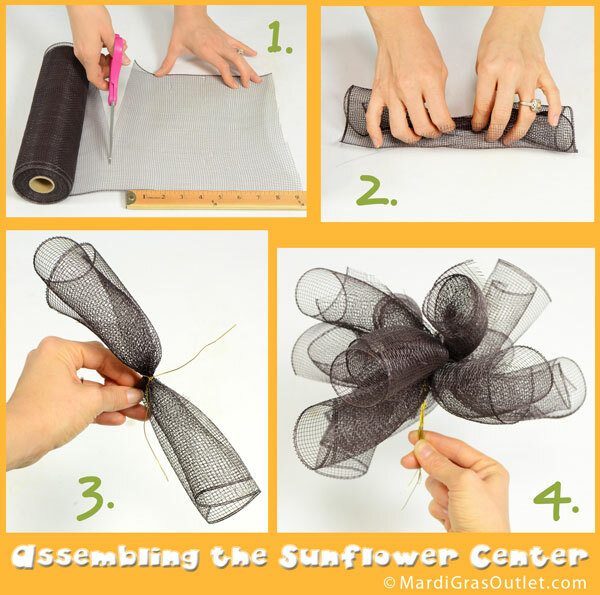 To make an entire sunflower you will need 12 sections of 24" mesh. 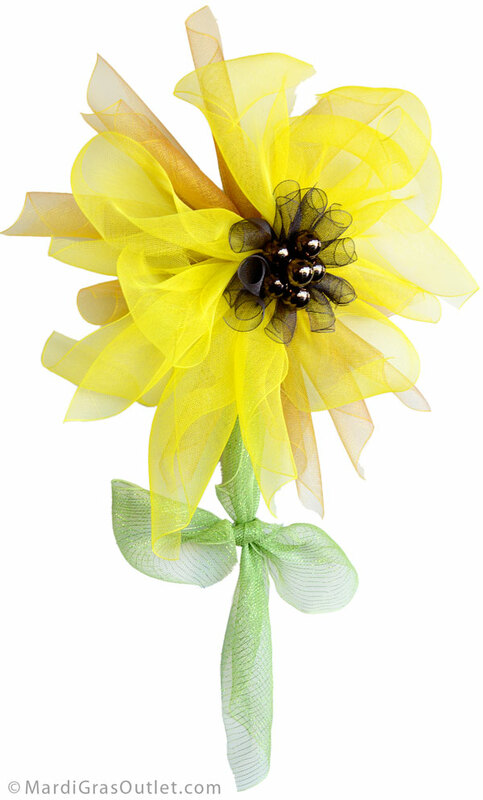 The Deluxe Sunflower Wreath has 6 yellow mesh petals and 6 petals of brown gold mesh. Stretch each mesh petal at a diagonal to form its shape. When you have 6 stretched out, grasp them in all in the center, and wire them together with a 9" length of wire. If you are making a Sunflower with only one mesh color, then repeat the process so that you have two bundles of mesh petals. We wanted our background petals to have a slightly different shape and dimension, so when we created our darker mesh petals, we rolled the mesh at a diagonal, (instead of stretching it like we did for the bright yellow petals). Cut 6 more lengths of mesh, each should be about 24" long, and roll them up. When you have rolled up all 6 pieces, cut a long piece of floral paddle wire, about 18-24 inches, and twist it around the bundle of petals, then twist the ends of the wire to secure. Do not trim the extra wire. Stack the two bundles of mesh on top of each other. The bottom bundle should have the extra long wires. Bring the bottom wires up and over the top bundle, and twist to secure the two mesh colors together. Leave the wires pointing upwards so that in the next step you can secure the center of the flower to the petals. Cut 5 sections of mesh from the brown 10" wide roll. Each section is be about 9 inches long. Roll up the mesh so that you have short tube. Twist an 8" length of floral wire around the center of each roll of brown mesh and twist to secure. Grasp the wires of all 5 rolls and twist them together tightly. This is now the Sunflower's center. Lay down 3-4 tinsel ball ties across the paddle wire coming out from the top of the sunflower- as shown. 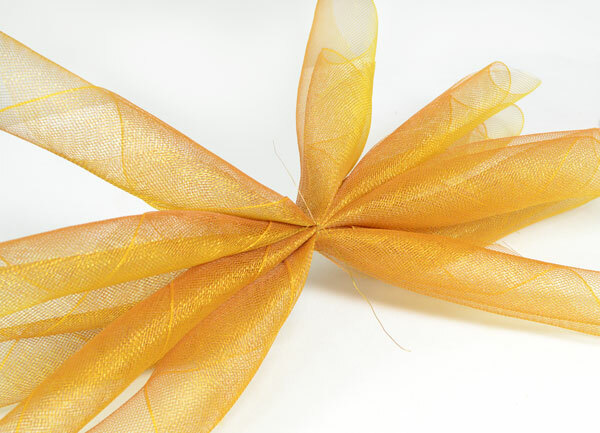 Use the floral wire on the flower petals to secure the tinsel ties in the middle. Bring the paddle wire back underneath the sunflower, twisting the ends together one last time to make sure the entire sunflower is wired together. Place the brown mesh curls in the middle of the tinsel ties. 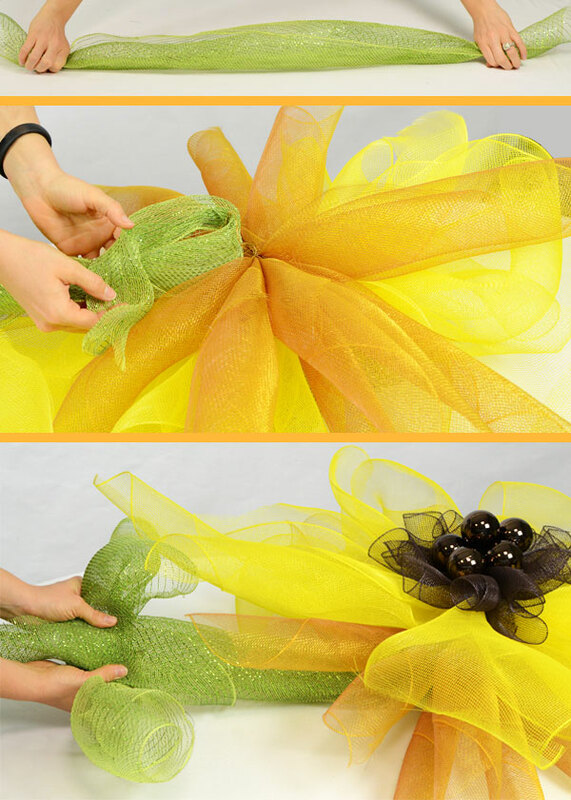 Bring the tinsel ties up to the center of the brown mesh and twist them together in pairs. This attaches the Sunflower's center to the petals. What are tinsel ball ties? Tinsel Ties are a pair of metallic ball ornaments attached on each end to a flexible wire tinsel tie. Sold in sets of 12 ties, they come in an assortment of sizes and colors. 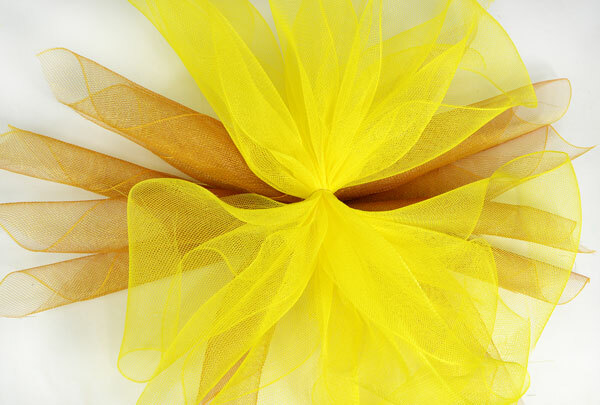 They are great for adding in accents to wreaths, garland or Christmas trees. Here we use them to simulate the center seeds of a sunflower. Click HERE to see all the styles of tinsel ties available. The final step is adding a stem, the "tail" of your wreath, which is optional. Begin by cutting a length of the Metallic Apple Mesh, about 24" long. 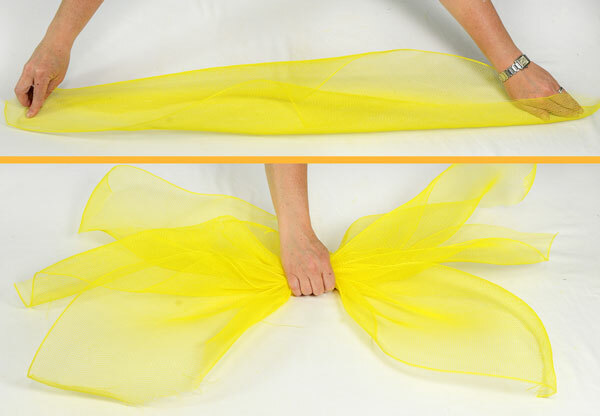 Pull it at a diagonal to stretch out the mesh the same way you made the bright yellow petals. On the underside of your sunflower should be the ends of paddle wire you used to secure the layers of your sunflower together. Twist them together to form a circle. This circle will give you something to hang your sunflower from. Now pull about 8 inches of your "stem" through the wire circle, and tying a knot. Cut one more length of green mesh, about 18 inches long, and tie it around the center of the stem. It looks like leaves on the stem, but it also stops the stem from unfurling. 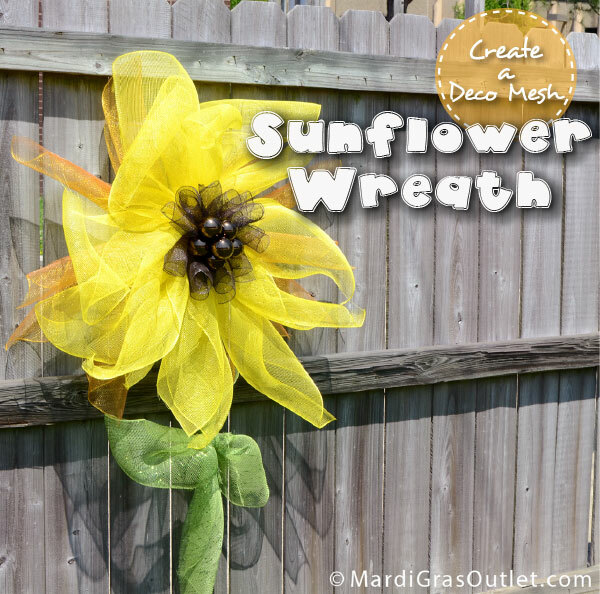 The Deco Mesh Sunflower Wreath is perfect for your front door, office decor, or to hang from gates and fences at home. Deco Mesh will not get soggy in the rain, so its the perfect decoration to leave outside- even during summer showers! So very cute and creative!!! Thanks so much for sharing this great idea and tutorial with us!